In a large bowl, combine the potatoes, eggs, ham, salt and pepper. 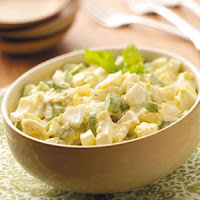 Combine the egg and sour cream; add to potato mixture and gently toss to coat. Transfer to a greased 11-in. x 7-in. baking dish. 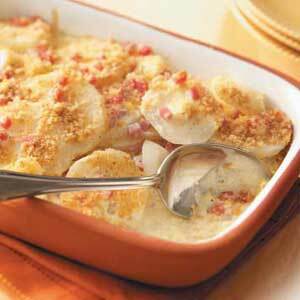 Toss bread crumbs and butter; sprinkle over casserole. Bake, uncovered, at 350° for 20 minutes or until a thermometer reaches 160°. Yield: 6 servings. 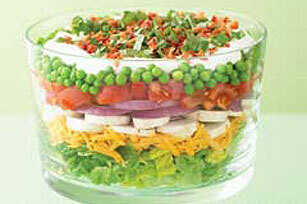 LAYER lettuce, 1 cup cheese, mushrooms, onions, tomatoes and peas in 3-qt. bowl. MIX mayo, sour cream and basil; spread over salad, completely covering top of salad. TOP with remaining cheese and bacon. Refrigerate 5 hours. 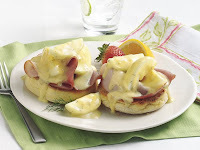 1 Place eggs in single layer in large saucepan or Dutch oven; add enough cold water to cover eggs by 1 inch. Bring to a boil. Immediately remove from heat; cover and let stand 15 minutes. Drain; rinse with cold water. Place eggs in bowl of ice water; let stand 10 minutes. Peel eggs; cut eggs into quarters. Set aside. 2 In medium saucepan, prepare sauce mix with milk and butter as directed on package. Stir in quartered hard-cooked eggs, lemon juice, dill and pepper. Cook and stir 2 to 3 minutes or until thoroughly heated. 3 Place ham on microwave-safe plate; cover loosely with microwave-safe plastic wrap. Microwave on Medium for 2 to 3 minutes or until thoroughly heated. 4 Place 2 muffin halves on each serving plate. Arrange ham slices on muffins. Spoon egg mixture over ham.